L.D. 's Super-Fine '59 Lets Everyone Know Who's Calling The Shots. 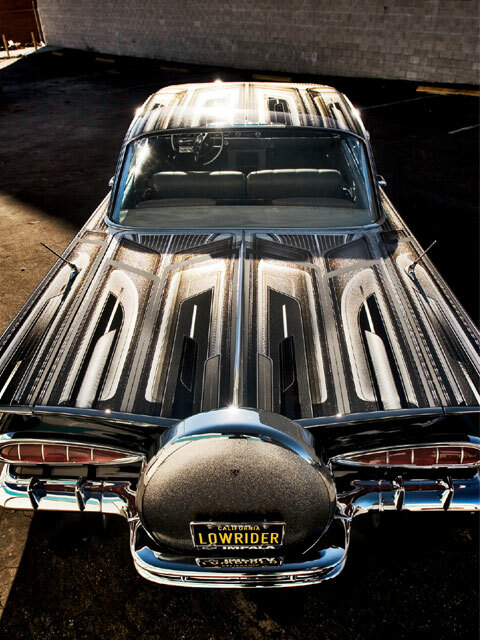 There are certain things that make a lowrider what it is. The “guts” are the hydraulics that lift and lower the car to its “knees.” There’s also the plush interior that cradles you and the bass-heavy sound system that rocks you, but it’s a car’s paint that’s the first thing you see when a lowrider rolls up on you and probably what keeps you looking at it. Colorful paint jobs normally grab your head and turn it, but there’s something to be said about the more subtle grabs, like clean monotone graphics that incorporate different textures. 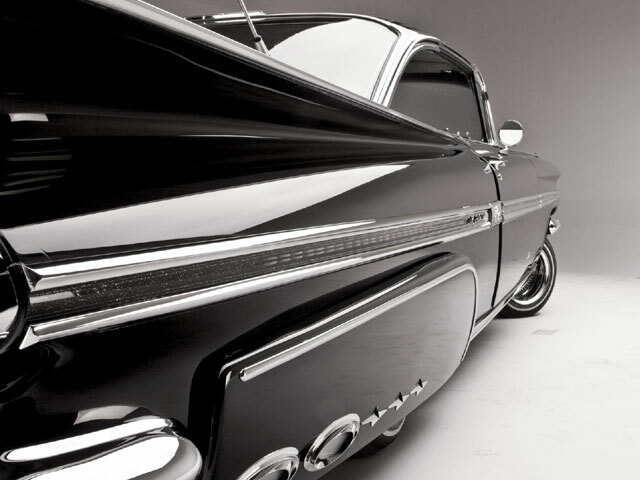 Such is the case with L.D.’s ’59 Chevy Impala, “Nina Ross, The Boss.” There was a time when a certain car manufacturer said, “You can have it in any color as long as it’s black.” L.D. followed that thinking for his base, but, of course, the lowrider instinct in him took over after that. Wanting to live up to “the Boss” image, L.D. knew that he had to have something to make heads turn. Painter Levi add some very clean and impressive graphics, flowing from the roof to the rear quarter panel wings. Sitting in the sun, the finish glistens and sparkles like rippling water, and on close examination, you can see a myriad of patterns and effects. 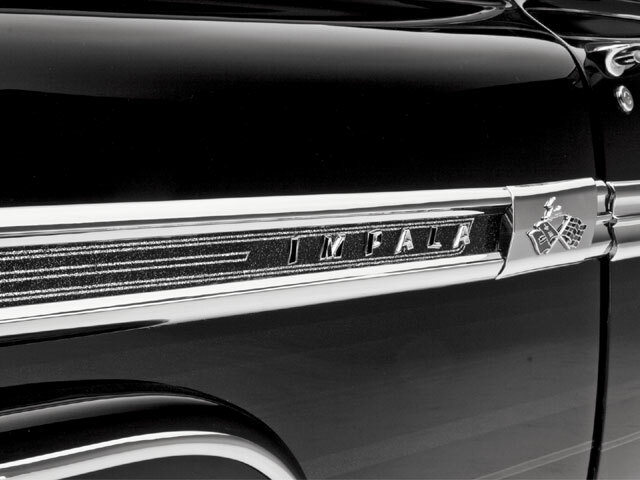 Lifting the hood and trunk both reveal plenty of chrome and details. The 383-c.i.d. engine received its share of attention with headers, intake, carb and MSD 6A ignition. A serpentine pulley system keeps the fluids moving right along. 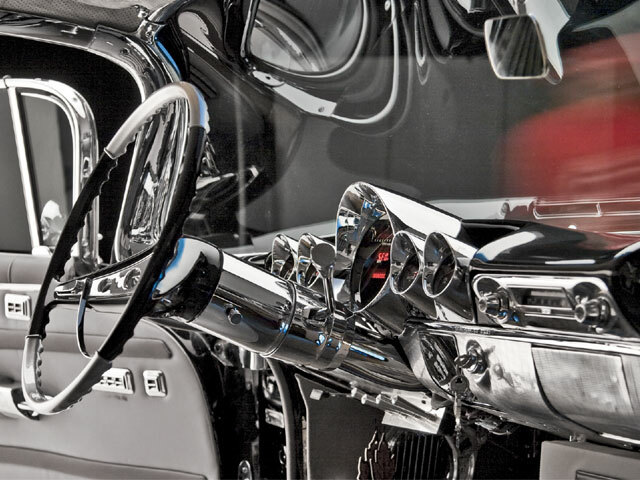 The sound of the 383 is one that will have your ears bowing down to the Boss; exhaust rolling through the Magnaflow dual system with conviction. The trunk takes similar cues, but on the other end of the sound spectrum. 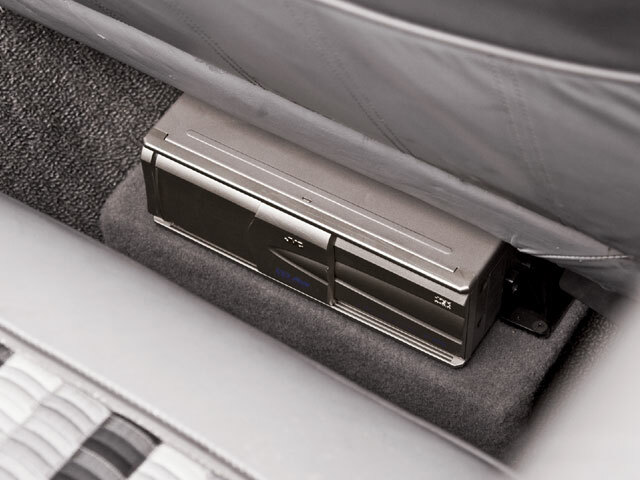 Three Kicker subwoofers pound in the trunk, threatening to open it up with a turn of the volume knob. 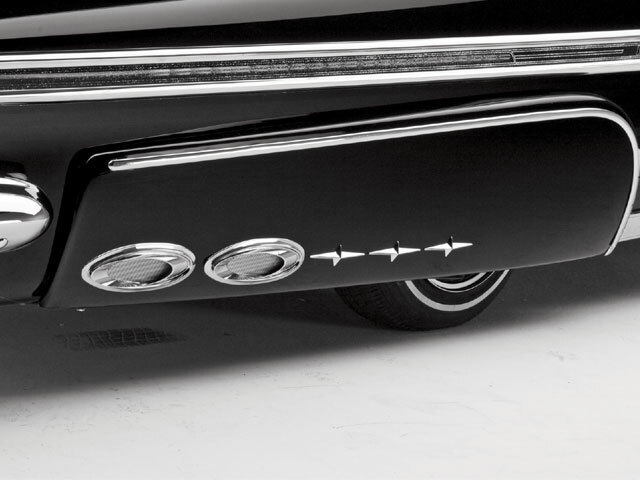 The two-pump, eight-battery system takes up what would be a voluminous trunk, laying out the ’59 quite nicely. And when the car is locked up, there’s the glistening of chrome from the undercarriage. On the aural tip, there’s the aforementioned Kicker subs, along with a complement of other Kicker speakers, Precision Power amps and Alpine head unit. Nina Ross, The Boss combines all of the necessary elements to make her worthy of being the boss and then some. Engine/Drivetrain: The ’59’s running a 2004 383-c.i.d. small-block with polished serpentine pulleys, polished heads, MSD ignition, Magnaflow dual exhaust and B&M transmission. Lonnie at Homeside Performance did the engine work. Body/Paint: Levi at Liquid Blueprints in Lynwood, California, handled the bodywork, paint and graphics. 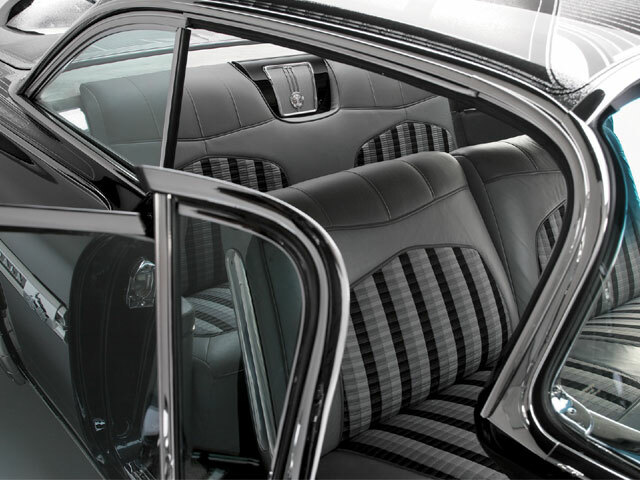 Interior: Ben at Supreme Interiors in Inglewood stitched the black, silver and gray leather upholstery with a gray suede headliner. 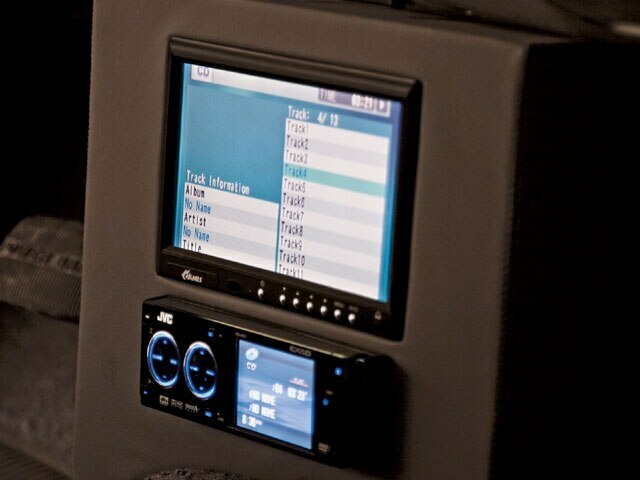 Sound System: Damen at Making It Customs in Inglewood installed a JVC head unit, Precision Power amps and Kicker speakers and subs. A JVC TV and DVD player rounds out the entertainment package. 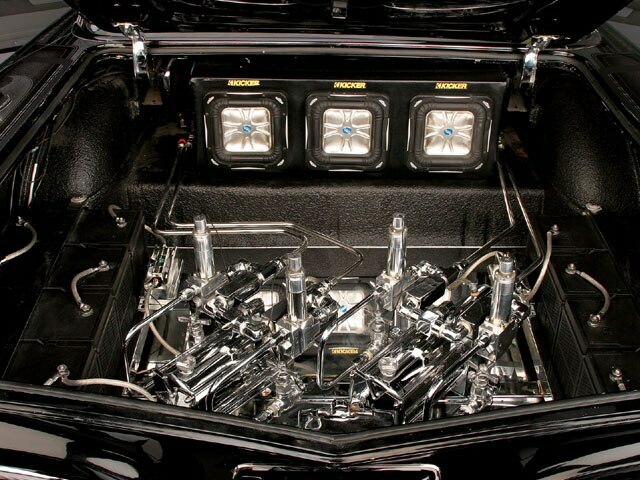 Setup: Joe at M&M Hydraulics in Gardena equipped the ’59 with a pair of chrome pumps, four dumps, 8-inch chrome cylinders, four switches and eight batteries.